1J. A. Dobrowolski (dobrowalski@magma.ca), Y. Guo, P. Ma, and D. Poitras are with Institute for Microstructural Sciences, National Research Council of Canada, 1200 Montreal Road, Ottawa, K1A 0R6 Canada. 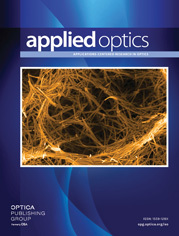 The equipment and methods used to produce wide-angle antireflection coatings based on Reststrahlen materials are described. The optical constants of the coating materials used in the construction of the multilayers were determined by spectrophotometric ellipsometry and are compared with the literature values. The measured performance of an experimentally produced antireflection coating is compared with the expected calculated performance. The reflectance is low over a wide range of angles, but only in the narrow-wavelength region at which the refractive index of the Reststrahlen material is close to unity.